Like other skipper butterflies, this Hammock Skipper (Polygonus leo) has a plump body and a large head and eyes, all of which give it a rather moth-like appearance. 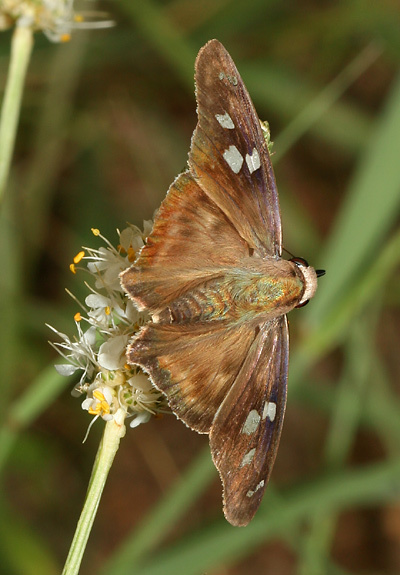 The ventral hindwing is patterned in brown and covered with a faint light blue sheen. There is a distinctive black dot near the base of the ventral hindwing. The dorsal wing surfaces are dark brown with three large, white squares on the forewings. Hammock Skippers range from Argentina through Central America into parts of the western and southern United States. Hammock Skippers are a characteristic species of the hardwood hammocks (small hills with hardwood trees in marshes or wetlands) of Florida, which is where these butterflies get their common name. 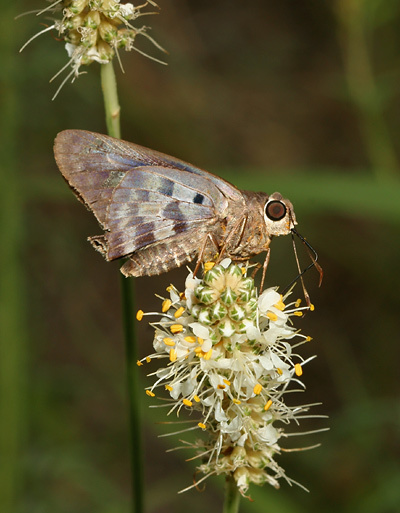 Here in Arizona, Hammock Skippers are found in or near riparian areas and woodlands. I spotted this Hammock Skipper in a lush grassy area near a wash south of Tucson, where it was busily sipping nectar from the flowers of a White Prairie Clover (Dalea candida). While adult Hammock Skippers feed on flower nectar, the caterpillars will feed on various plants in the Pea family (Fabaceae). White Prairie Clover is in the Pea family, but I didn't notice any caterpillars on it (just lots of butterflies).